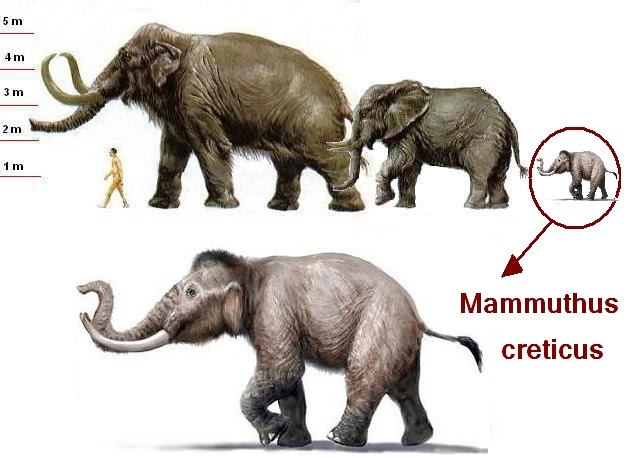 The smallest dwarf mammoth, standing at about 1 meter at the shoulders, has been uncovered on the Greek island of Crete. As explained here, with little or no predators and limited amounts of food, insular dwarfism might occur in large mammals. In other words: insular dwarfism helps giants survive within the limits imposed by islands. Over the course of less than 800,000 years — a short stint on an evolutionary scale — these dwarf elephantsare thought to have descended from larger European elephants, weighing 100 times as much, which lived on mainland Europe. Scientists analyzed dwarf fossils first discovered in Crete more than a century ago. Paleontologists have long argued whether the remains belonged to curvy-tusked mammoths or straighter-tusked elephants. Teeth discovered more recently in the same area in Crete now suggest the animal was in fact a mammoth (Mammuthus creticus). A newly found foreleg bone suggests it was the smallest mammoth known, standing little over a meter high at the shoulders and weighing only approximately 300 kilograms, making it about the size of a modern baby African or Asian elephant. These dwarf mammoths were not woolly mammoths. "When most people think of mammoths, they think of woolly mammoths," lead-scientist Victoria Herridge said. "We think this dwarf was more adapted to warmer environments, more in appearance like modern African or Asian elephants, with a sparse covering of hair, although they would have had curvy tusks like all mammoths." 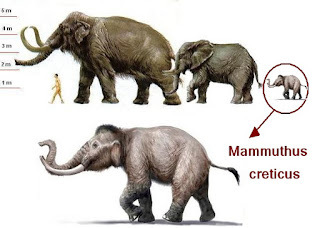 The Cretan mammoth is the first evidence for extreme island dwarfism in mammoths. It would have been comparable in size to the smallest dwarf elephant known, the extinct Cyprus dwarf elephant (Palaeoloxodon cypriotes) from Crete or the Maltese dwarf elephant (Palaeoloxodon falconeri )from Sicily and Malta, which stood only about 1 m high at the shoulder and weighed only approximately 240 kg. 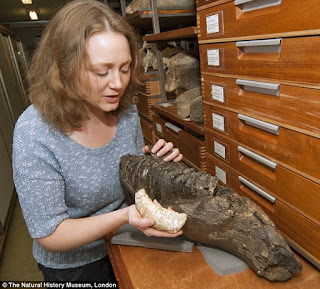 The fossils suggest this dwarf mammoth was descended from one of the first mammoth species to arrive in Europe from Africa. As such, the researchers suggest dwarf mammoths may have evolved much earlier than previously thought — possibly as far back as 3.5 million years ago. Insular mammoths are further known from Sardinia (Mammuthus lamarmorai) and the Californian Channel Islands (Mammuthus exilis), as well as Wrangel Island (northeast Siberia) and St Paul (Pribilof Islands, Alaska) (Mammuthus primigenius).